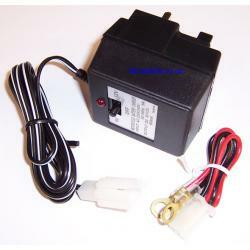 A useful little plug in motorcycle batter charger for either 6 volt or 12 volt batteries. The unit itself plugs into a standard UK socket, and you set your choice of 6 or 12 volts. Your battery will be charged at 500mA or 1/2 Amp, for 10-20 hours. Once the battery is fully charged the unit will switch itself off. There is a little wiring harness and plug which you can leave attached permanently to your battery, making the connection quick and convenient.